Well I worked through my China Glaze polishes successfully and have been doing the same with my OPI's some will be featured as NOTD's others will be in various nail challenges I'm doing. Wooden Shoe Like To Know? is one of the few brown polishes I own but it's gorgeous! A brown creme with red and gold shimmer. I stamped over this with cheeky plate 23. It's a tribal design (consider it a sneak peak of something to come). I tried Nicole by OPI - One Voice and it stamped quite well. 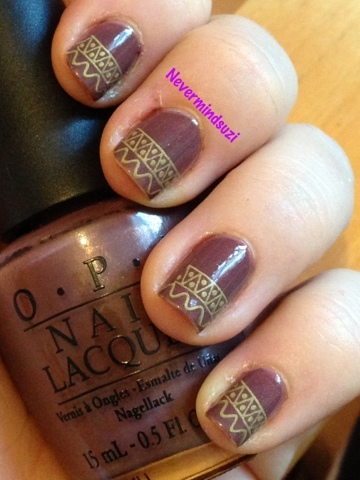 The gold stamp works really well with the base coat, I love this Manicure! Cute mani. I love the design and the colors you used. 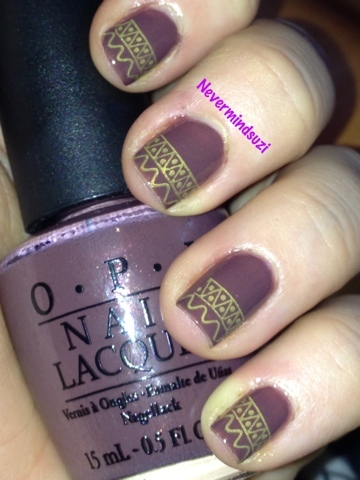 I really want that stamping plate now.